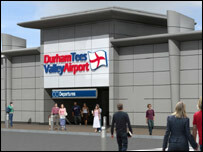 A £11.6m improvement scheme for a County Durham Road has been welcomed as good news for the local airport. The managing director of Durham Tees Valley Airport says that the work on the A66 at Long Newton will boost the airport's own development plans. The Highways Agency plan will improve a junction with a poor safety record and includes new link to the airport's main access road. Work is due to start in spring and completed by autumn next year. Hugh Lang, the airport's managing director, said: "Obviously the most important benefit of this scheme is that it will make things a lot safer for local people and everyone who uses the A66, including people travelling to and from the airport. "From our point of view, high quality transport links are vital to all our plans for developing the full potential of our whole site."